Keep soups, stews, deli salads, and desserts contained within your compatible containers, with this ChoiceHD microwavable translucent plastic deli container lid! This deli container lid is just what you need to package and store food with ease. Each lid is made of heavy weight polyethylene with a translucent appearance for product visibility and quick identification of contents. At the same time, the durable design ensures that this lid is great for delis, restaurants, and grocery stores. I purchased these lids with the ChoiceHD 16 oz. Microwavable Translucent Plastic Deli Container - 48/Pack. They fit the 16 oz containers as well as the large containers. One of my soups got knocked over as I was stacking them and the lid was secure enough that it did not pop off or spill. Love all the Choice products on WS, these 12 oz microwaveable container lids fit tight on the bottoms, no vent so you will have to poke a little hole. The Choice Deli Container lids are best if used with their Deli container. They always seal and we never have any problems with them leaking. You do need apply a little pressure to secure them on the container. I would highly recommend these if you are purchasing the 16 oz Deli Container. Love these lids. We use them on the 32oz Deli Containers and they fit very tight and wont come off even with out lemonade in them. Our customers love them and love how tight they stay on. They hold up great and when the lid is on the container we can punch a hole easily in the top for the straw. I ordered these lids and their corresponding containers to fill several of them with jello and stack them neatly in the refrigerator. They are useful for home use also, not just for delis, they can be used for preparing batches of soups or stews to freeze for quick meals, much healthier than pre-packaged, processed ,store bought can goods. They are the perfect portion size and also microwaveable, if you choose to heat directly in the container instead of a bowl so they are versatile in many ways. We love these plastic deli containers. We use them as tupperware in our household. They age well even when regularly washed in the dishwasher. It's also nice to be able to give people leftovers without worrying about seeing the containers again. An excellent buy for translucent lids that fit on the ChoiceHD 16 oz and 32 oz plastic deli containers. Unlike other brands, none of these came warped, which is a huge plus. Great deal! These fit well on our deli containers and do not spill food . it's very helpful to have extras! Using these since long time no complaints. Great container to send sauces in for large orders of pastries. Coupled with the lid, it is a secure container for travel on to go orders. Also good for in house storage. As with containers that fit these, they are very sturdy, thick and easy to put on. They won't crack in the freezer and hold up well to microwaving. I would recommend these any day. These lids are wonderful for our slimes. they fit on both the 8oz and 12oz containers perfectly so, we can easily just grab a lid for whichever container we are using. they are nice and see through while still being sturdy and strong. they make it easy fr us and customers t see exactly what slime is n the container before they buy. These lids fit perfectly on the coordinating plastic deli containers. I mainly use these containers for freezing soups and sauces. The lids fit securely enough to keep air out and avoid freezer burn. I purchased the translucent 12 oz. deli containers to hold my sprinkle collection because I make my own custom sprinkle mixes. The deli containers were a great solution. I purchased these corrugated lids so that if they fell over, the contents would not spill out. A lot of people complained about how hard they were to remove from the cups but that's what I love about them: they are spill proof. I would recommend. I prefer these heavy duty delis better than the more flexible ones because you can at least stack weight on them and they won't flex. Also the lids have a nice tight seal so if you drop them they are less likely to spill open. Especially good for takeout. This lid fits all of the ChoiceHD deli tubs 8oz - 32oz Tightly. We didn't have any issues with spillage. Also holds up well in freezer applications. Finally replacing all the lids that I either lose or friends and family walk off with. I use these for everything, quick plates, coasters, plant bases. So multi purpose! We love that this comes as an option. As you can imagine - sometimes the amount of lids & cups don't end up matching up because some are broken or whatever. So it's nice to be able to buy JUST the lids vs a combo of lids & containers. Excellent lid for deli containers. Fits snugly and doesn't leak. Amazing value for the price point. The lids are produced very consistently and they are all perfect fits. Just great! These fit on the ribbed style of delis, which I find are generally much more solid. This fit perfectly, and are generally pretty much liquid-tight. We love that these kids are interchangeable on the different sized deli containers. We use 8oz, 16oz & 32oz and its nice to not have to try & remember what kid goes to what size. These lids are great, and I love it that you only need this one size lid to fit all the different Choice HD deli containers. The lids are translucent which allows easy identification of the container contents and they are also dishwasher, fridge and freezer safe. These lids work perfectly on the Choice HD container. They fit well and they can hold lots of things even like liquids in without issue. These lids give an air tight seal and are very durable. I can write on them with a sharpie and it easily washes off for the next use. 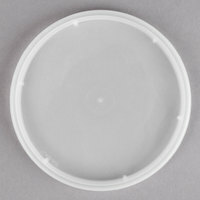 We use these disposable/reusable plastic deli lids on out 16 oz and 32 oz plastic deli containers. They seal well and you can use them many times before they get stained and icky. I like those lids. They were really good but only thing is when you close u have to press little hard to close it otherwise u might left from side. Everything else is good!! I purchased these lids to go with the small containers I already had. They fit well and sealed nicely. I would definitely recommend these and repurchase them. These lids work well with our 8 oz, 16 oz, and 32 oz deli containers. It is nice to have a lid that can work with multiple sizes, thus reducing the storage space we need specifically for lids. The lids fit perfectly on the CHOICEHD 32 oz Microwaveable Translucent Plastic Deli Containers. They are practically childproof because they are so snug on the containers. Liquids definitely cannot spill out unless you break the container or lid! These lids are the perfect fit and addition to the 8 oz deli bowl. They fit really snug, so there’s no issues of spillage. I would definitely recommend this product! Cheap price but great quality! great for leftovers, freezing stuff, and soups. I like to meal prep these are great for that. The lids fit perfect. These are perfect! I initially bought the "flush" lids, but they were a HASSLE to get onto the 8 oz. clear deli containers from Choice. These lids, however, are quite easy to fasten onto the containers & seal them perfectly. You know that your customer will get a nicely contained soup when it goes out for delivery. Excellent for simplifying storage solutions, one lid to rule them all! These are dishwasher and freezer safe. I love that all of my containers use this lid now. After several months of use I haven't seen any issues with warping or wear. These lids fit the 32 oz. plastic deli containers perfectly. It's a nice tight fit with no leaking issues. They are washable and reusable. However, I write on them and toss them when done since I have so many extra! This cover is very sturdy. It doesn't leak at all, work with other sizes. Thank you for the best deals. I will purchase this again. I use this lid for the awesome 16oz. & the 32oz. Container. They secure very well. Ive never had any spills or or loss any freshness. These lids are amazing. The items were delivered very quickly and were exactly as described. They fit the containers very well with an air tight and leak proof seal. I use these lids for the 16oz and 32 oz containers . They are stackable and easy for storage . They seal easy and are dishwasher safe . I purchased these container covers for the various matching containers They are super sturdy, easy to wash and have a nice tight seal. They are also reusable! Great lids for 32 oz plastic food storage container s nice tight fit and seal to keep food secure from spilling. Excellent price from WEBstaurantStore Again !!! These lids fit the 16 oz deli containers great. The seal keeps liquids inside. My issue with them is in the freezer - the lid is difficult to remove without cracking on frozen products. Thawing or microwaving the products allows the lid to be safely removed, but I'd rather not have to do this step. We appreciate your review, Vanessa! We are sorry these lids are not meeting your expectations. If you have any questions about the product you purchased, please contact our Customer Solutions team. This lid is perfect with the ChoiceHD 8oz translucent plastic deli container. I use them for my caramel and chocolate fudge dipping sauces. They are microwaveable which is fantastic to soften the caramel dip for apples or other dippy things. Fit it for choiceHD microwavable translucent plastic deli container. I believe there has multiple sizes container with one lid. I will start to change this product. It is solid and safe to keep the food. I bought these to go with the ChoiseHD 8 oz containers. My husband never brings my containers home from work and when he does they are always caked with week old food. I love that these and the containers are so affordable and can be one time use. I have washed and reused them also & they have held up great. They dont warp when used with hot foods and so far haven't gotten the dreaded microwave marks that so many of my containers have. My husband said they hold liquids and soup in just fine also! So glad i found these! will buy again! SUPER tight seal, this is definitely one of the best sealing lids I have ever come across, can definitely keep liquids in too. As for durability, i've already had several crack, but given the price i'm not too discouraged. What is there to say about a deli container lid... They hold up just as well as the containers themselves, which is to say fantastic. I gave run these through the dishwasher dozens of times and they have all held up great. the uniform size means I am never at a loss for a lid. They also lock well, which I learned yesterday when I dropped some clarified blackberry juice out of my fridge and the container stayed together saving me from a PIA cleanup. I do a lot of to go catering and meal delivery, so I use deli containers a lot. Great price. Great product. Locks on well. Easily cleaned in dishwasher without warping. Hands down the best lid for freezing and microwaving. The lid looks good on the deli container, it seals and keeps the food fresh and doesn't seem to allow the smell of whatever food is in it to get out through the refrigerator or deli case. With this lid we have NOT seen warping, melting, or other issues that the lighter lids similar to this had. Great product! A great quality plastic deli lid that fits a lot of my containers. The lids are strong and snap on really quick. They create a strong seal. We use these containers daily for storage with these lids and for scaling ingredients. They hold up well and are a good value. Will continue to purchase these in the future! I purchased these to use with the microwaveable containers. Together they are super functional and have multiple uses. Although used mainly for food, I've also used them for craft supplies. These are quality made but we found sometimes they were hard to put on and take off the containers. Depending on your usage this could be a positive. These fit perfectly on the containers and close tight and secure! They are very good quality and have a great price on them! I am very happy with this product purchase! I will continue to purchase these in the future! Great lids for a great price. They fit nice and snug onto the containers and I love how they are microwave safe so you can reheat in them.